The iTunes Ping social music service is coming to Twitter, as CNET reports that Apple has inked a deal with Twitter to let users link their Twitter and Ping accounts. Users who post reviews, purchases and other opinions on songs and albums through Ping can now also share that information with their Twitter friends, according to a post on the official Twitter blog announcing the partnership. 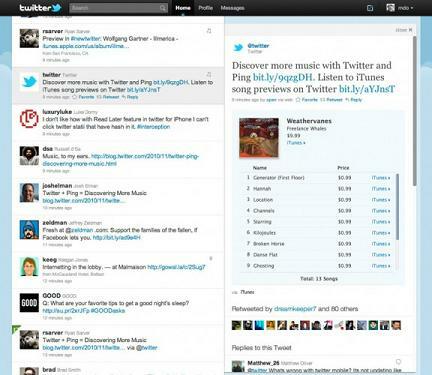 “Once you’ve linked the accounts, whenever you post, like, review, or tell your friends why you purchased a song or album on Ping, this activity will also be tweeted to your Twitter followers — complete with playable song previews and links to purchase and download music from iTunes,” wrote Twitter Vice President for Business and Corporate Development Kevin Thau. Ping was a disappointment at launch, largely because it was a social networking tool that lacked integration with either Twitter or Facebook, so this deal helps to close that gap. Apple had originally said that Ping users would eventually be able to sync their accounts with Facebook, but talks surrounding this integration eventually broke down.